Another huge success, Field Study #002 differed from Field Study #001 somewhat in that instead of having conversations about a myriad of experiences individuals are having in the Anthropocene, the group drilled down and honed their energy to brainstorm optimal words for two particular phenomena. This may have been influenced by the composition of this Field Study weighing heavily on the side of renowned word experts as well as water and drought experts from diverse backgrounds. (Please see the end of this report for a complete list of participants). Cardinal of Encyclical Ambimonium, Gabrielle Harp shared his new neologism – GWILT a word he coined specifically for the Bureau describing “wilting due to water guilt” a double bind experienced in a drought when you feel guilty if you water your plants and reversely guilty if don’t water your plants as you witness them wilting. Gwilt is a portmanteau composed of guilt & wilt. 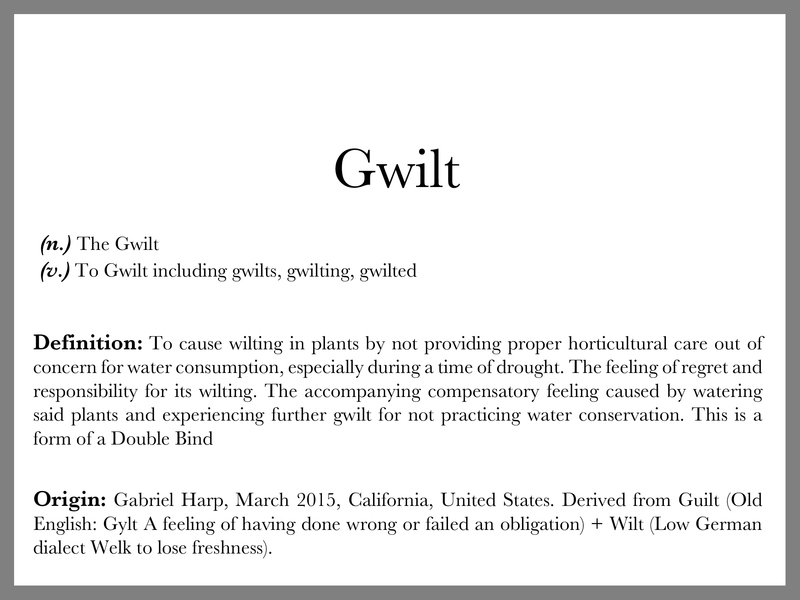 All field study participants could totally relate to gwilting, and immediately and officially adopted it into their lexicons. Gluck (bad feeling, good luck). Suggestion was to inject a weather word as well. Happrehension (apprehension about your happiness). Suggestion was to inject a weather word as well. Faith Kerns PhD (a Fresh Water Scientist currently focusing on the California drought), brought up that despite the drought being incredibly depressing, we still need to enjoy the beautiful weather and beautiful planet we still have, not focus solely on what will be. This lead to a discussion about human time vs. geological time, and human beings’ role to “save the planet” vs. to bear witness to a great time of change. The group then further discussed how the earth can easily exist without humans, yet human beings rely on this planet for survival, so what does it really then mean when we say “save the planet”? Many went back and forth about whether a new word for psychic corpus dissonance should reflect the more collective experience or if it should be an emotion or feeling an individual feels so as to personalize it more which many argue is needed since climate change already feels out of reach and hard for people to deeply internalize. 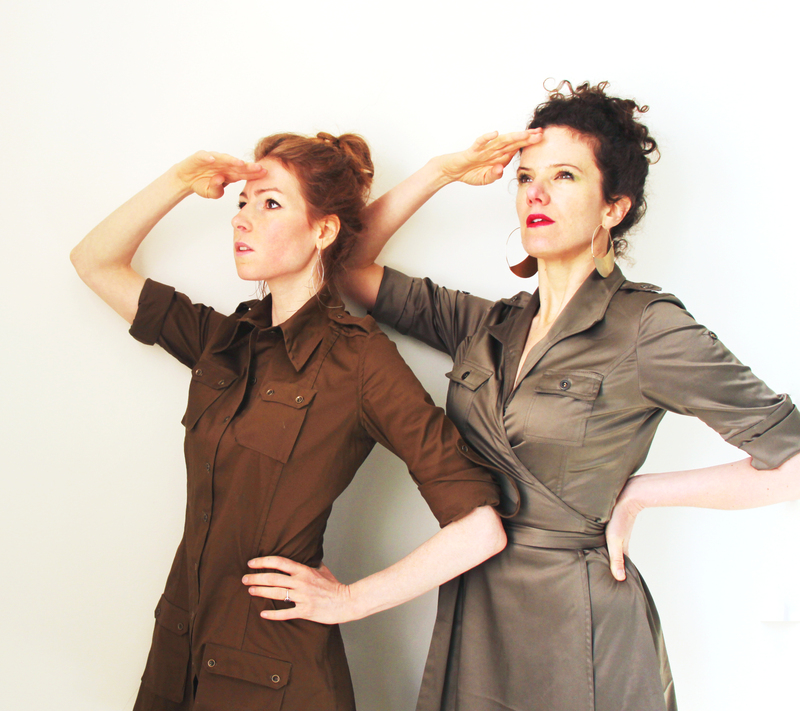 The other concept that this group drilled into deeply was introduced first by Nicole Markoff, but everyone related to – the experience when you witness someone doing something out of hospitality or kindness but which is actually ecologically destructive, and you have an intense visceral reaction to the act — but suppress it because of social etiquette. People then excitedly began to riff off of each other, providing examples where they all have felt this – e.g. someone at a check out counter is trying to help you by giving you 3 plastic bags, they “overbag” your purchase unnecessarily, or when someone runs the faucet to calm an upset baby because the sound of running water soothes babies, yet witnessing it being done, especially during a drought, is painful for the observer. . . people were exploding with examples of this sensation. The discussion around this began coalescing specifically around visceral reactions to seeing people waste water during the drought, but expanded to encompass all witnessed unnecessary wasteful behavior. Please note the Bureau is now working to refine this word / phrase and will post it to the BLR website the moment it is coined. This led to a larger discussion around values of different social groups, the relationship of the individual to dominant cultures and their respective norms, especially vis a vis climate change. Participants in this field study were: Chief Lexicographer Erin McKean of Wordnik, Chief Onomastician Anthony Shore, Cardinal of Encyclical Ambimonium Gabriel Harp, MA in Ecology Evolution & Behavior whose day job “combines social science research with design and climate change”, Liz Enochs, an investigative journalist who keeps a word blog of sesquipedalians, Marc Shapiro, also a writer fresh off the road from witnessing and reporting about the epic California drought and Artist Nicole Markoff whose grandmother hosted the radio show “There’s a Word for It” and whose art practice “creates works that currently navigate the philosophically nondual space between landscape and thought production” as well as Faith Kearns PhD, a fresh water scientist focusing on the epic California drought 24 hours a day, 7 days a week. Please note as in all our Field Studies, many more vibrant and enlightening conversations occurred. These are but a few of the highlights of Field Study #002. This completes the Bureau Of Linguistical Reality Field Study Report Back #002: Drought, Water and Farming. Please check back for Field Study Report back #003: Also Drought, Water and Farming, this time held in Spain as part of the JOYA Encuentro de Arte y Ecologia #2.